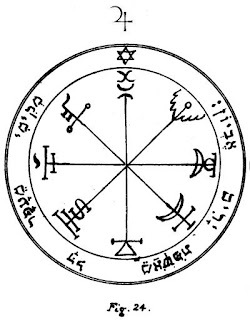 Mathers wrote: “This pentacle has great power if you consider it with the verse “he raises the poor from the dust and lifts the needy from the ash heap Dunghill” This pentacle does not have an angel associated with it and Mathers claims that it will stop the angels and demons who are protecting treasure from falling into your hands. In short it is the key to material wealth. So lets look at this verse and see what it means. Adam was made from the ‘dust of the earth’. Cabbalistically this means that the scattering of light within creation. This light was gathered by god and ensouled with the divine breath. The light has to pulls the first is toward unity and the second is the illusion of separateness. On the material plane, humans are not born equal. Socially some have money others do not. God has decided who does and who doesn’t. The majority of the rich are the Paris Hiltons of this world. They do not create their wealth and power. It belonged to an ancestor and they inherited it. If that power was lost they would not have the ability to get it back. The dust of the earth gathered by their ancestors will erode down the generations. However to the poor it is impossible to get enough material dust. Power appears to them in small chunks and therefore they cannot get enough of the very substance they were created from. They sit on dung hills of small materiality begging for other people’s power. However they may be taken out of this state. The One, YHVH, takes away this. Its nature is to bring things together so the beggar is raised up and power (money) is drawn to him. This does not mean that the self made man is enlightened, just that he has aligned himself to the same forces that draw more of the sparks that he has inside towards him. Occultists are notoriously poor and often lacking in power. Why is it that a beggar wins the lottery and squanders the lot and ends up poor again? The answer is that they are not in tune enough with their Higher Self or YHVH. The poor occultist exists because they do not believe they should be concentrating on the dust, the beggar who wins the lottery fails to see God’s hand in his transformation and seeks to return to his dung heap. But we are not prisoners to the whims of an idiosyncratic God. We are made in its image of a God which is bigger than that. We are are reflection of the God that is beyond the rim of the Universe, Ayn Soph Aur. So it is the spirit in man (HVShHY) that lifts us from our dung heaps. The god within draws the sparks of matter of what we need towards us. It is not a matter of ‘trusting in God’ that will help us win the lottery but attuning ourselves to our higher selves to draw all things needful toward us. This is why he six rayed star is at the top of he wheel. This seal tunes us by its symbolism towards our higher self. But not in just a spiritual way, a material way. In the centre of the seal is eight spokes with different signs on them. These are like spokes in a wheel which have been frozen for an instant. What these are we cannot be sure. On one is a triangle so we know we are looking at some form of manifestation. There is a hebrew yod which means that this is like a closed fist and meant to rotate. Yod is a symbol of the tarot key the hermit. Two of them are crescent moons, perhaps suggesting that there is an unconscious change required in the person. However despite this maybe we do not need to know what it means. The symbols speak deep inside us. As we watch the wheel turn (like the Wheel of Fortune in Tarot which is ascribed to Jupiter), it brings its own revelations. There are 25 letters in the verse. This number is attributed to Sagittarius, the archer and the Tarot Key Temperance which happens to be ruled by Jupiter. The 25thpath connects Yesod to the Higher Self at Tiphareth. 25 is also the number of the Rose. So by transmuting ourselves to the Gold of Tiphareth we are lifted from begging dust on top of a material dung heap. We draw what we need by aligning ourselves to our higher self on the path of Temperance. The reason occultists are powerless and therefore poor, is because they live in the Yesod consciousness which is only marginally above the dunghill that is the rest of humanity. They need to soar upwards further up the path of Sagittarius and behold their Higher Selves. From there they can draw all things needful, both spiritual and material. It’s amazing how often occultists struggle to make money. Some might argue this is because they’re concentrating on “higher” things, but I think it’s more revealing of a failure down here on Earth. Obviously this is a controversial area, but I think when all aspects of a person are working together they will enjoy both spiritual and material success, not just one or the other. It’s interesting how Jupiter is linked with some higher spiritual aspirations and also with earthy “luck” and success. – Dean, you are so right! If you are a magician, you should be able to control material forces as much as astral or spiritual forces. I love Israel Regardie’s comment that anyone who has not yet mastered the energies of Malkuth and the material world, has no business climbing up into any of the higher spheres. – these days I always think of this in terms of Hexagram – where one triangle represents Spirit and the other Matter – the two need to work in harmony – and be equally activated, for a complete and fulfilling life. And it is interesting, as you point out, that Jupiter, associated with material Abundance, is also associated with of Spiritual Aspiration and philosophy. I’d like to see the actual statistical numbers about the economical scale of occultists in the western world compared with the rest of the world; I think that the normal westerner who is living just above the poverty line may be relatively wealthy compared to those who are living on $1 a day in many third world countries. Yes, in general I agree that an occultist in the west is probably more likely to fall in the middle class to poverty level compared to other westerners. But is this due to Occultism itself? I highly doubt it. I think these people were in that economic scale before they ever discovered occultism and they looked towards magic as the solution to their economic woes. Those who lack in wealth and power often look to gain it through magic/occultism. Unfortunately few find the solution in those fields of study. Some pray to win the lottery, despite the numerical statistics being against them for winning. Those who already have wealth and power will often join groups like the Freemasons for socializing and networking rather thank join overtly occult bodies. Yes, from the endless resources of the limitless substance. Before one starts to interpret here , maybe you should again consult the Pentacle of the manuscripts . The interpretations of Mr. Nick Farrell are beautiful mind games with respect to the letter JOD , but this letter JOD can only be understood in conjunction with the other letters. Mather has made ​​a big mistake in correcting the pentacle. He knew just not enough for these manuscripts to understand completely . Thus we find , on closer analysis not only the letter JOD on the left , but we notice the above is above the crescents , the letter Aleph . Next we find in other older manuscripts , the right would have to face the JOD , the letter Daleth , which is missing from Mathers and Nick Farrell disregarded in the interpretation. Down towards the letter Aleph , still missing the letter NUN , as can be seen clearly from the manuscripts. This result is now so clearly the word of God or the name ADNI = ADONAI . ADNI is the Lord , the God of Malkuth , and the master of the material world = Earth. While we can all interpret a lot, but that’s not science or knowledge . 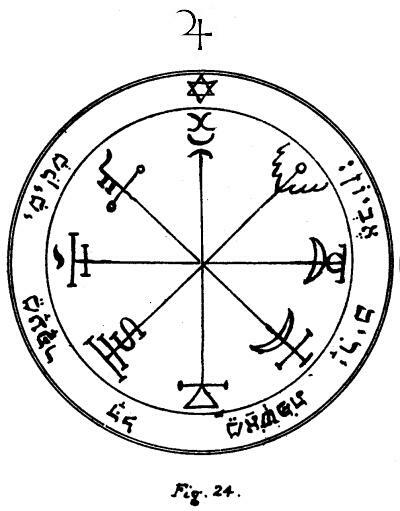 I do not understand the meaning behind it , to interpret a pentacle that is incomplete or full of errors. In any case, all readers of my commentary may like to analyze the Mansukripte again and see clearly that Mathers made ​​many mistakes , now all occultists build on their magic.